I get a lot of questions about what kinds of pizza and pasta sauces are keto-friendly, especially since sharing my keto cast iron pizza recipe a while back. The unfortunate truth is that many store-bought brands of sauce are off limits due to added sugars and fillers that raise the carb count. This is true for tomato-based sauces (although Rao’s and others are keto-friendly options), but surprisingly also for a lot of cream and cheese based sauces too. 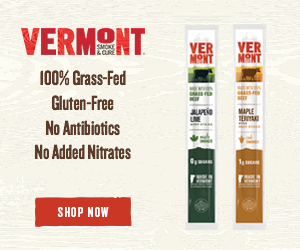 You would think it would be easy to make a sauce that’s 95% cream, cheese, and butter keto friendly, but apparently there’s plenty of food companies that just can’t resist getting their carby fingers all over everything. No worries, though! 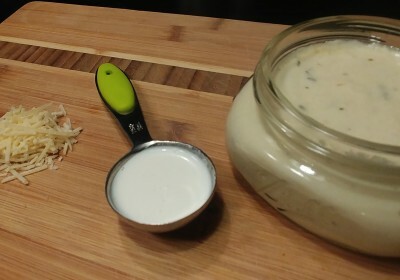 This keto alfredo sauce recipe is super quick and easy to make with just a handful of ingredients. It’s great with zoodles or as a sauce for keto pizza. This creamy, cheesy sauce is the perfect topping for zoodles, seafood, or even low carb pizza. Per 1/4C serving: ~235kcal, 24g fat, 6g protein, 1.5g carbs. Melt butter in a saucepan over medium low heat. Add garlic and cook for about 1 minute or until fragrant. Add cream cheese and half and half. Simmer for 3-4 minutes or until smooth, stirring frequently. 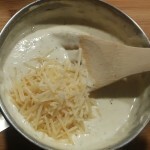 Add mozzarella, spices, and remaining cream. Cook for a final 3-4 minutes, or until sauce reaches desired consistency. Best served warm. Store refrigerated in a sealed container. Reheat in the microwave or in a saucepan over medium low heat. 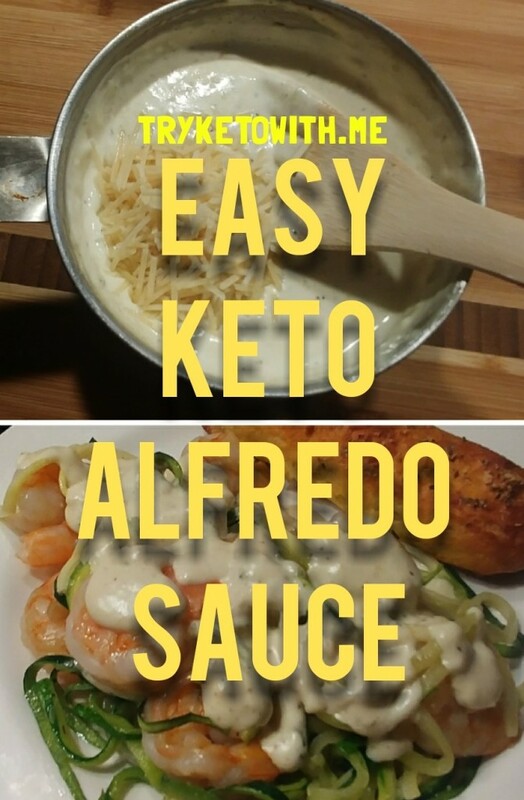 You can cut down on the calories in this keto alfredo sauce recipe by halving the cream cheese and/or swapping out 1/4 cup of the cream for your favorite nondairy milk substitute, but you will sacrifice creaminess. Don’t have mozzarella? Feel free to use all parmesan or even substitute gruyere instead. It’s normal for this keto alfredo sauce to thicken after storing it in the fridge. it might even look solid! Just reheat and it will return to its normal, creamy consistency.